It’s hard to believe my little DIY blog is already a year old. It’s been interesting documenting all most of my projects this past year. I still have about 15 or so to catch up on. I’ll get there. Slowly but surely. I didn’t start this blog for readership. And I don’t make anything or post anything for the purpose of gaining more readers. I just make things and document how it went, including the things that didn’t work so well. I do this for me because it makes me happy. Making others happy along the way is an added bonus. Not only has starting this blog helped me to remember all the crazy things I get myself and Travis into, but I feel humbled by knowing I’ve helped out so many fellow DIYers. Nothing warms my crafty heart more than receiving photos of a finished project from an excited reader who followed my blog—someone I’ve helped save some money and time. This next year I’m going to keep doing my thing. A project here. A project there. Maybe two posts in a week, but not another until the next month. I’m sure you’ve realized by now that I’m unpredictable, a little nuts and I change my mind a lot. Mostly, I just plain love making things. I hope you tag along to see what’s coming up next. 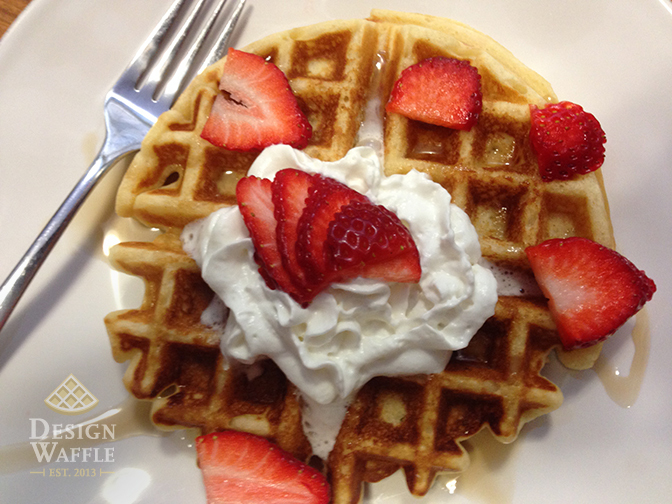 What better way to celebrate than to eat waffles for breakfast this morning? I have to say, these are the best waffles I’ve ever had. No boxed waffle mix for us anymore. I’m ruined for the good stuff now. It takes a lot longer to make them, but once you try them you’ll be hooked too. Check out this recipe I found at http://www.beurrista.blogspot.com. How I Saved a Beaucoup on Wedding Centerpieces! As always, thanks for reading! Now go eat a waffle! 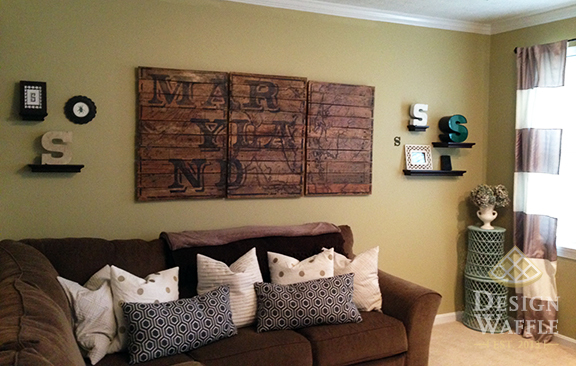 I’m a Maryland girl through and through, so naturally I wanted our family room artwork to have a tie to our roots. 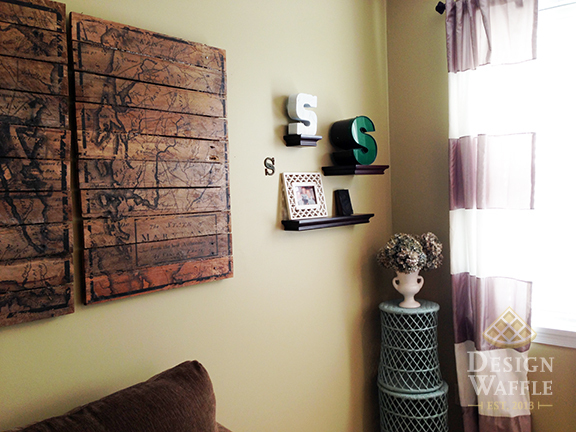 After searching the internet and stores for the perfect piece to hang in the room, I decided to make something. 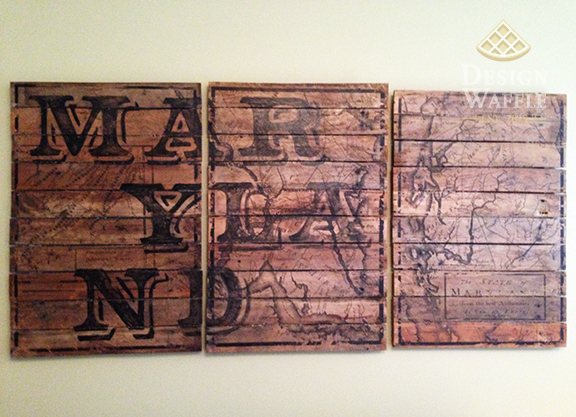 I found an old map of Maryland, and with the help of Photoshop, I designed three panels and overlaid the word “Maryland” broken into three lines. Then I mirrored the images so they would be printed backwards. I ordered engineering prints through Staples for a whopping $3.59 each! You can’t beat that considering each print is 24″x36″. 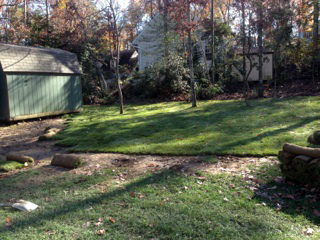 Remember when we laid sod in our backyard? Well, we had 5 wood pallets leftover from the delivery stacked up by our shed that were begging for a new life. So Travis knocked them apart with a hammer and I did my thing. 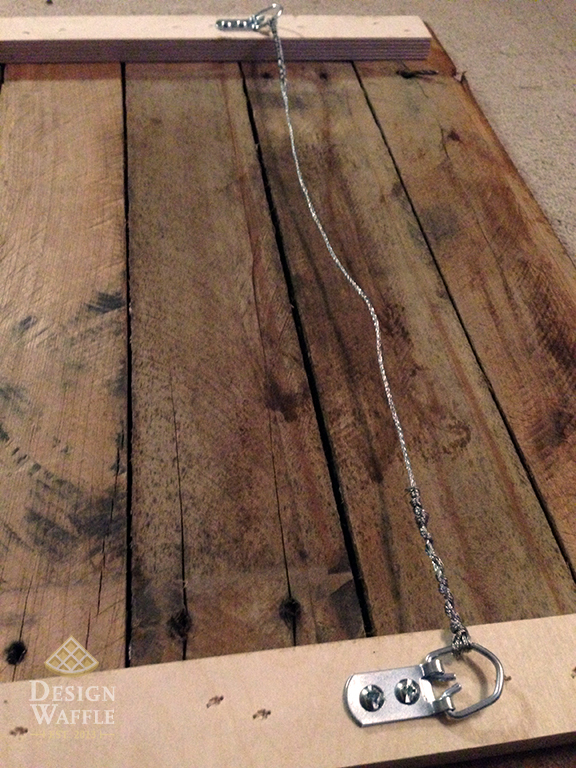 I cut each length of wood to 24″ long and lined them up. Then I used wood glue and nails to attach two pieces of wood to the backside of the panels, holding everything together. I trimmed the excess paper from the edges, right up to the bold black border around each print. Then I squeezed all the gel medium from the tube onto a paper plate and brushed a layer on the front of the first wood panel. I spread it evenly, not too thick and not too thin… just enough so the paper will stick. After the top surface of the wood was covered with the gel medium, I placed the paper print side down onto the gel. Using the brayer and plastic spackle knife, I smoothed the paper making sure to get rid of any bubbles. 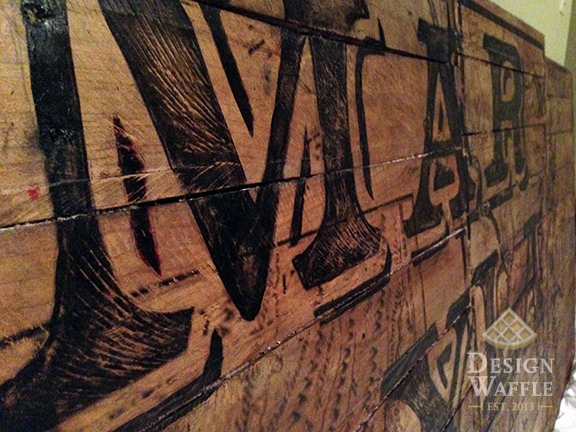 It’s important to make sure the paper is perfectly adhered to the wood so that every bit of ink is touching. Then I let the panel dry overnight. The next day I saturated the panel with hot water. To move the process along, I laid soaked rags on the surface as well, while I used my fingers to rub the soggy paper off the wood. This part will take a while to do. For me, it took about an hour a panel… and my fingers were sore for days! I used wet rags to help rub the paper off along the way to give my fingertips a temporary break here and there. Once the paper was gone, only the ink remained on the wood. Then I let it dry overnight. Once dry, the wood had a white hazy look. I applied wood stain to the entire panel and that haziness went away. After the stain dried, I went over the transferred image with black paint to fill in any areas that didn’t transfer properly. 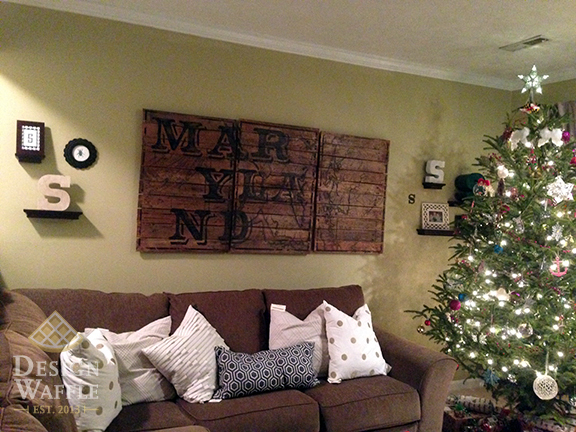 I also painted the word “Maryland” across the panels following the lightly colored lines that were transferred onto the board. I used sand paper to randomly roughen up parts of the panels. I initially planned to paint the letters a different color which is why they weren’t originally darker in the design and since the engineering prints can only be black and white I had no other choice than to paint the letters by hand. Then I changed my mind and went with black… you know, because I love to make these thing take longer than necessary haha! After the paint dried, I applied a rub on clear coat. 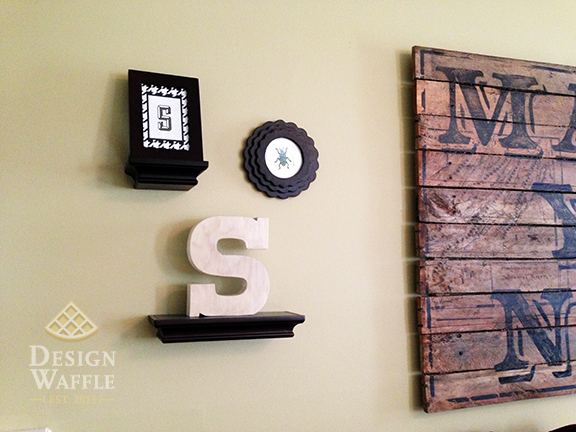 I’ve been collecting the letter “S” (representing our last name) so I hung floating shelves giving our collection a home. I’ve been thinking about painting the cream colored “S” on the bottom left shelf but not sure what color yet. I also bought some new pillows, which I just love. This poem set the theme for the baby shower. Last year our family suffered a tremendous loss that we still struggle with daily. A rainbow symbolizes hope and the promise of a happier tomorrow. We wanted to make sure this shower was a special as possible for my sister and her sweet little baby who will be here in a week from today. 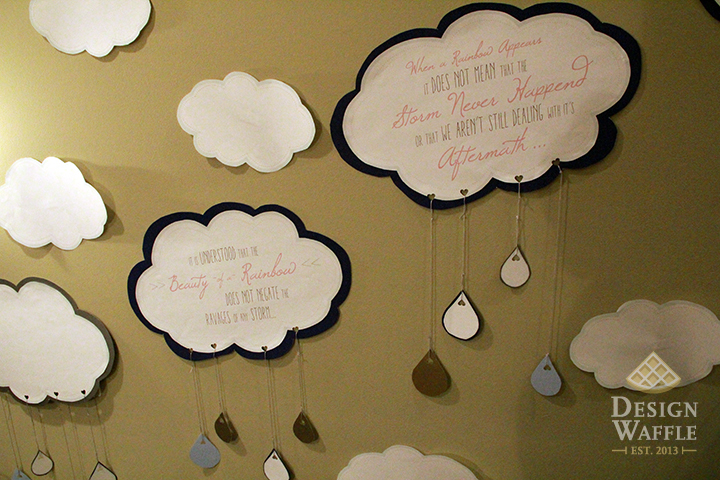 I printed each line from the poem on a cloud and mounted them with double-sided adhesive to colored cardstock. We filled the entranceway of my mom’s house with these rainclouds so the shower guests would understand our theme upon entering the main room, where they walked through a giant rainbow! 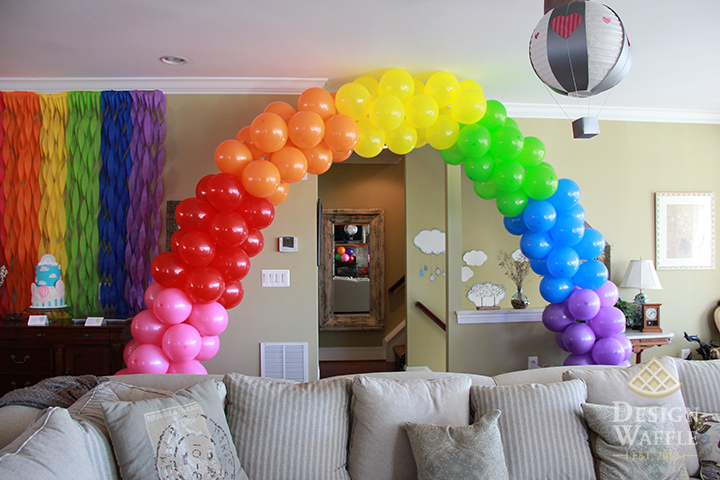 I cannot take any credit for this awesome balloon arch. My husband and brother-in-laws made it and they did an awesome job! They referenced a youtube video to make it. I have no clue which video, but hopefully that link is helpful. 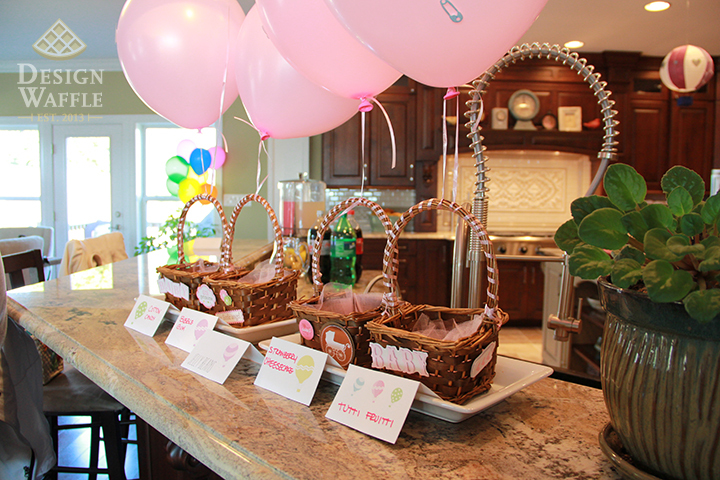 Once guests were in the main gathering space, they were surrounded with bright cheerful streamers, additional bunches of balloons and hot air balloons to add to the sky theme. I made these hot air balloons out of ordinary white paper lanterns. I cut cardstock and hot glued it to the lanterns. Then I attached little boxes as baskets with string, hot gluing everything together. I made 6 different balloons but ended up with photos of only 3. 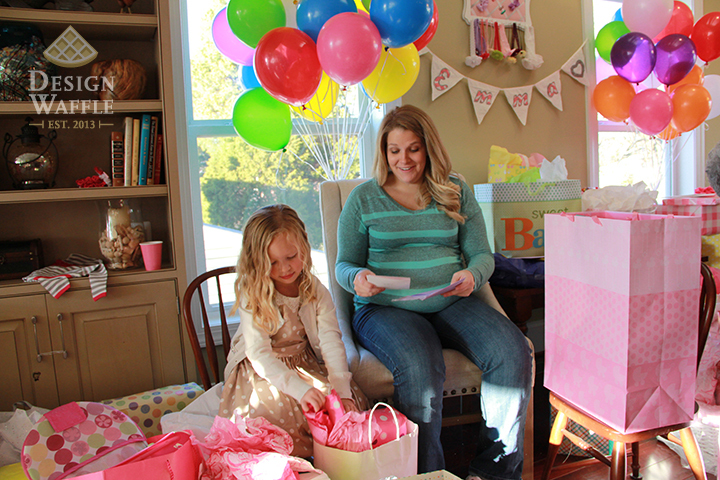 The gray and pink balloon will be saved and hung in the reading corner of Emma’s nursery. I was SO EXCITED about this cake. We were very lucky to have someone offer to make this cake for my sister free of charge. 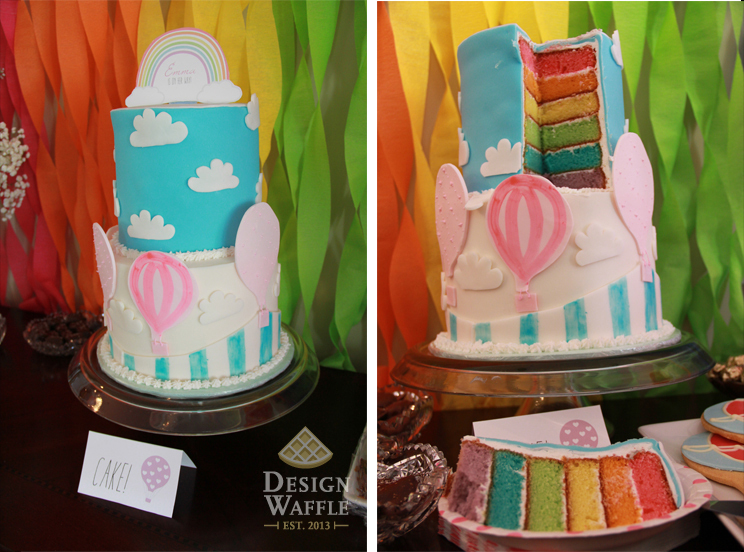 Not only did it fit our theme perfectly, it was both beautiful and yummy too! 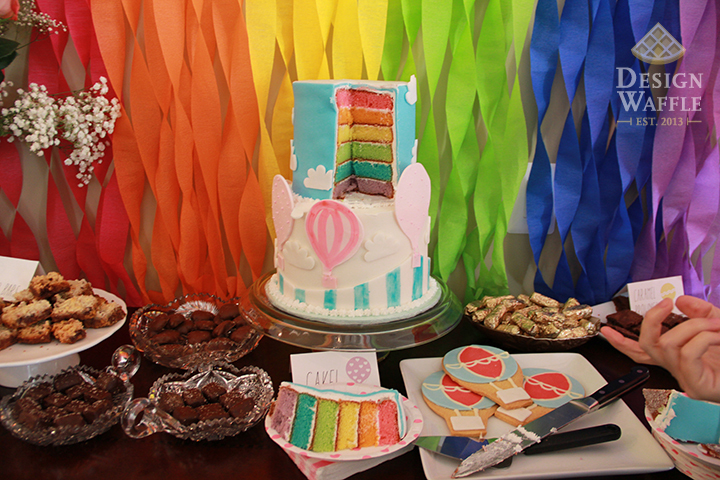 No future cake will ever compare after cutting into all these colorful layers. 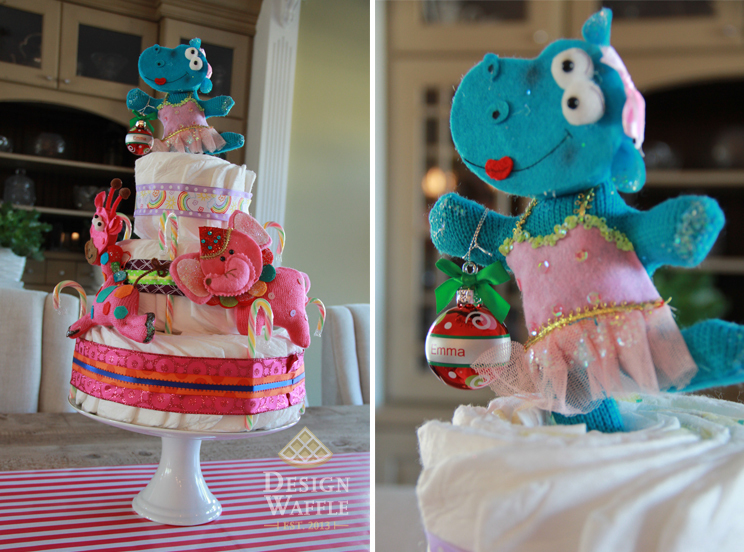 To make the diaper cake, I used 3 different sized round cake pans. I spiraled the diapers tightly inside each cake pan (making sure to overlap them quite a bit) then I tied some fishing line around the spiral. This took less than 10 minutes to do all three. I stacked them up and used ribbon to hide the fishing line. I made sure not to get any hot glue on the diapers when gluing the ribbon on so that my sister can reuse the diapers for their intended use. 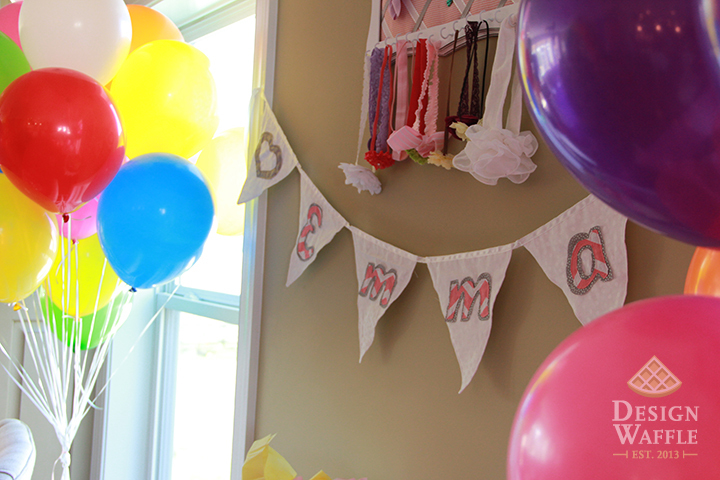 I made this cute fabric pennant for Emma’s nursery and it also doubled as a decoration for the gift table. I’ll be sure to fill you in on how I made it in the next couple weeks. 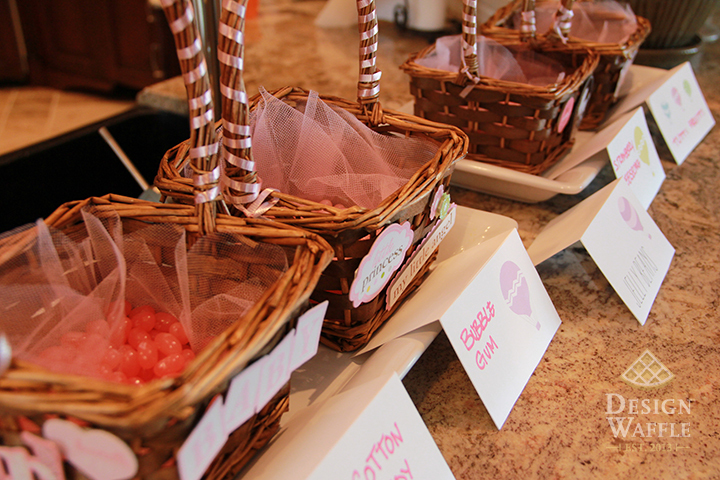 In addition to all the other sweets at the shower, my brother and his girlfriend put together this cute hot air balloon jelly bean bar. 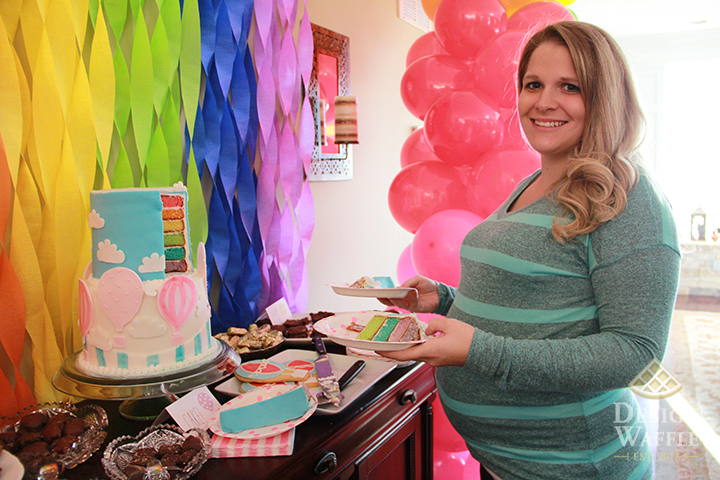 Only one more week until my sweet little niece arrives. 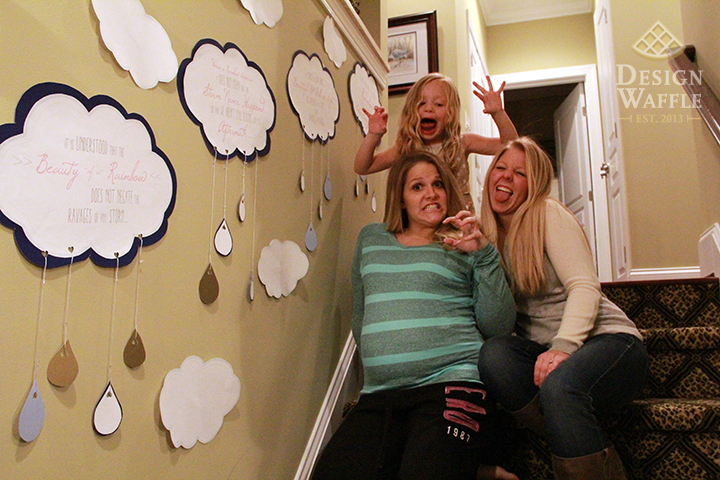 I know I can speak on behalf of many people when I say we can’t wait to meet her! FYI: Practically all the photos in this post are a different size. I guess that’s what happens when you use a combination of multiple phones and cameras! Sorry! 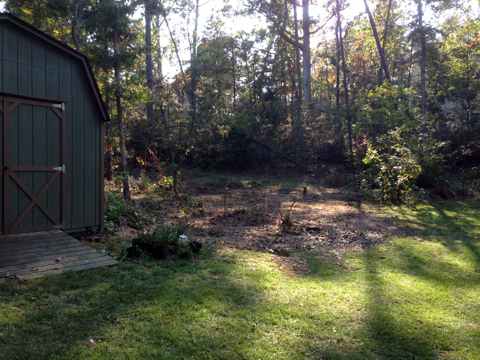 Most of our backyard was filled with weeds and dead trees. 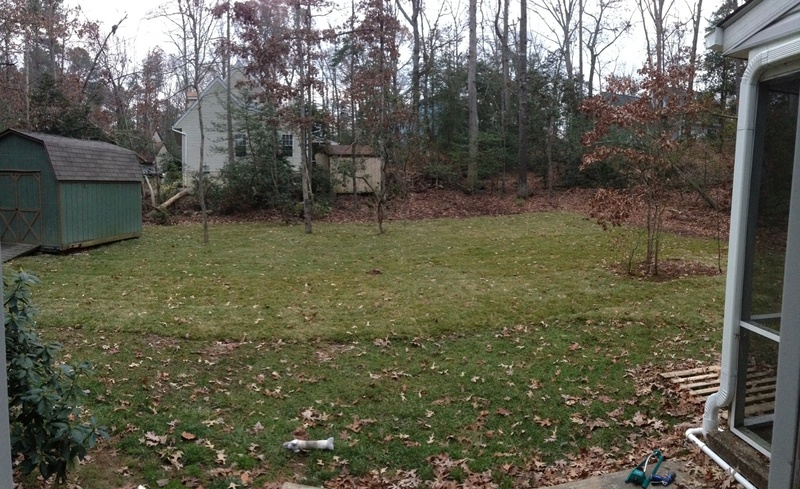 There was a hurricane a few months before we moved in that took down a few pretty large trees. The previous owners had the trees cut up but left the tree stumps and logs all over the place. We had our work cut out for us. 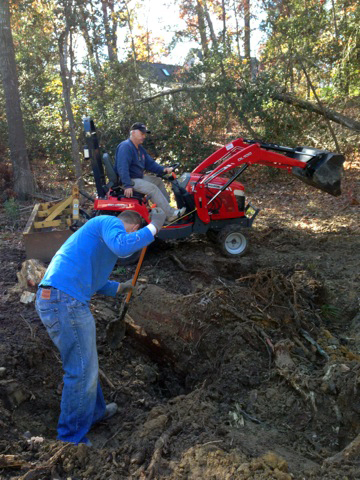 Lucky for us, Travis’ dad brought over his tractor to help pull out the stumps and little trees. 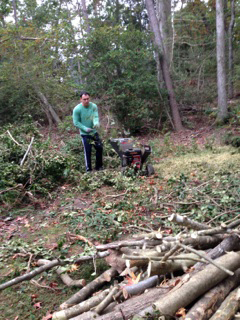 We used a wood chipper to chop up the brush. 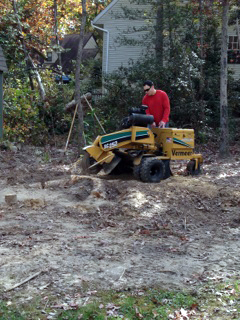 Once the piles were out of the way, Travis used a stump grinder to remove 8 or so stumps that were too short for the tractor to pull out. 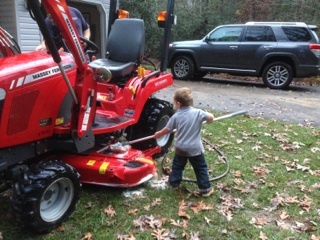 The rental place said he clocked over 7 hours in one day with the stump grinder! There was one tree stump that was particularly tough. This one was laying on it’s side, partly buried and still attached by deep roots. The guys tried their best to get it out themselves but were ultimately defeated. 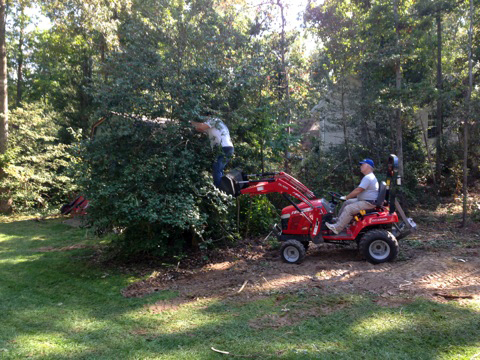 We ended up needing to call a professional tree removal company. They laughed when we told them we tried to remove it ourselves. They brought in a big tractor with a claw on the front and dug around it. Then they ripped it out. Money well spent. 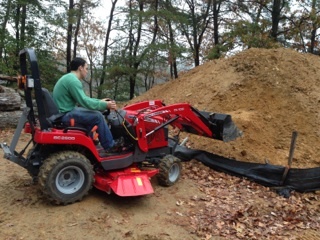 We used the tractor to get more dirt to fill the huge hole left from the stump, then we grated the land to make it nice and flat. 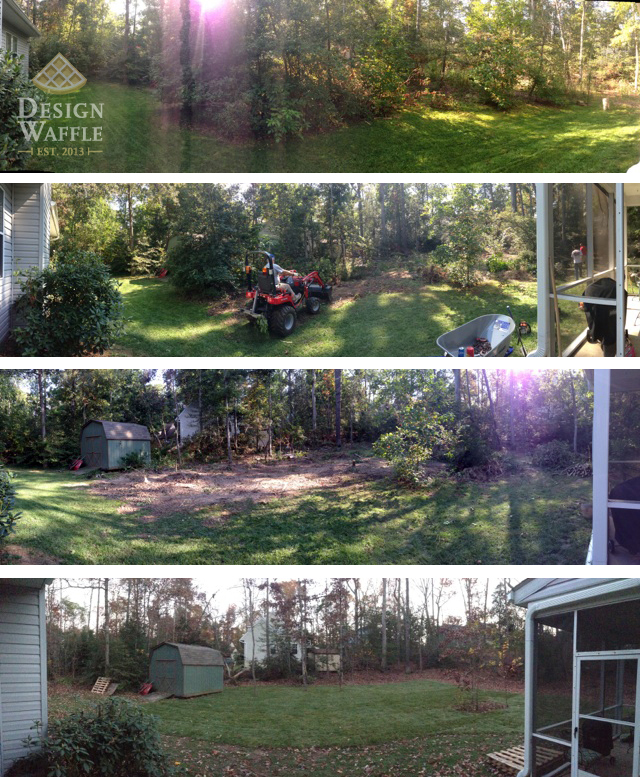 I couldn’t wait to get to this part of the yard makeover. 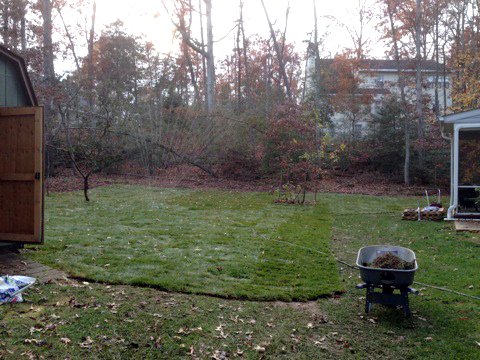 It felt like it would never get here after looking at a lumpy, muddy yard for weeks. 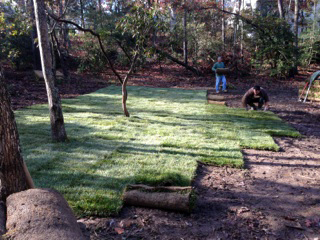 We ordered our sod online (I know, weird right?) from a place about an hour away. 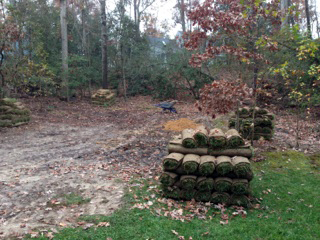 It was delivered and the pallets were placed randomly throughout the yard. 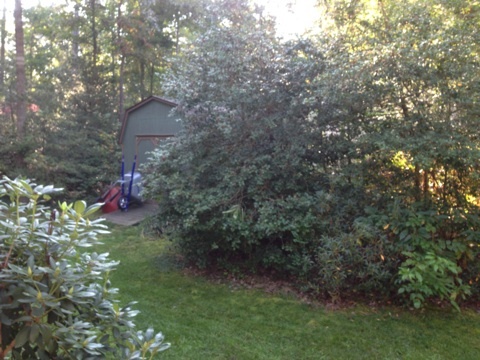 We ordered 2,900 square feet… so that tells you how much bigger our yard is now! 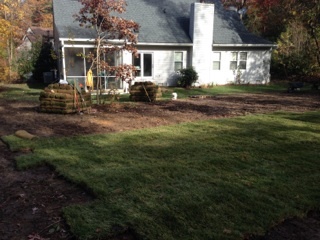 The next day we dug underneath the outer pieces of the sod where it met up to the old grass so it would be flush with the yard. 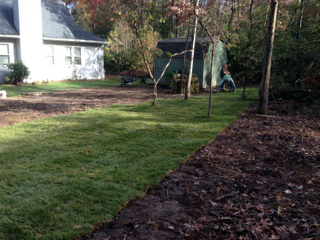 We also rented a yard roller to help smoosh the sod to the ground. The whole project took over a month. 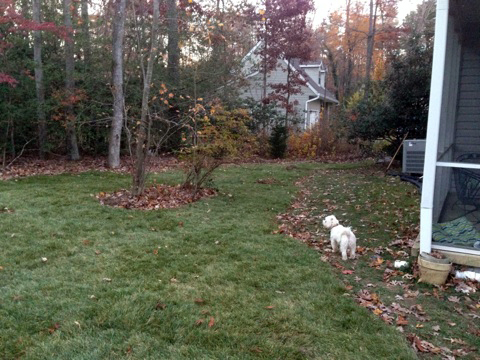 Kimble can’t wait until we extend his electric fence into the new yard…just a couple more weeks.